Cole Horton - Author & Professional Geek: Astromech.net is Back! After months of hard work behind the scenes, the official website of the R2 Builders Club is back! 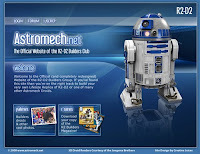 All of the best features from the old Astromech.net are there, including the galleries, resources, and more. Best of all, the R2 builders now have an official forums. While astro won't completely replace the yahoo group, the forums are a big step ahead. While every other respectable fan group has had a great forum for years, we now have an up-to-date place to call our own. Get on there and register, then be sure to add something cool. While you're there, please add yourself to the new builders map. The old map was bouncing people off, so we need this more than ever. Great job to everyone involved. See ya on Astromech.net!